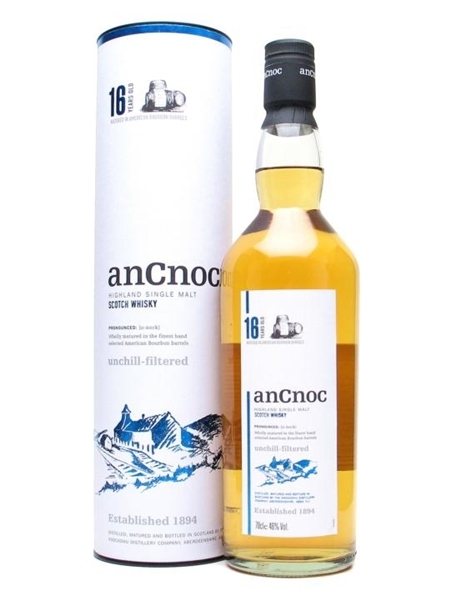 An Cnoc [a-nock] is summed up by the distillery itself branding it "a modern tradition". The whisky was rebranded in 2000 (elimating confusion with the Knockando distillery, also in Speyside) and now has a much more contemporary feel to it. But don't be fooled, its vast range of age-statement whisky and vintage whisky is evidence that it has a long tradition of producing whisky. An Cnoc 16 Year Old (~€80) was matured in bourbon barrels for at least 16 years and is bottled at 46% ABV.